The Rialto Bridge is yet another structure in Venice that is not only famous for its architecture, but its place in Venetian history as well. When traveling to Italy, it’s a well accepted fact that you don’t just go there to marvel at the beauty of the structures, but also at their rich culture and history. In a world where we’re all used to seeing things that are brand spanking new, it’s nice to know that we still have a part of us that is fascinated with the old. When you visit Venice you will undoubtedly come across the Rialto Bridge so you’d definitely want to know its story. If not, you might end up as one of those people who just stare at it and think, “Wow… what a huge, old bridge.” You don’t want to be reduced to that! If you truly want to experience Italy, it would be great for you to know more about it than that. The Rialto Bridge is one of the most famous bridges in Italy. The Ponte di Rialto, as the locals call this famous bridge, actually comes from quite a long line of wooden predecessors. 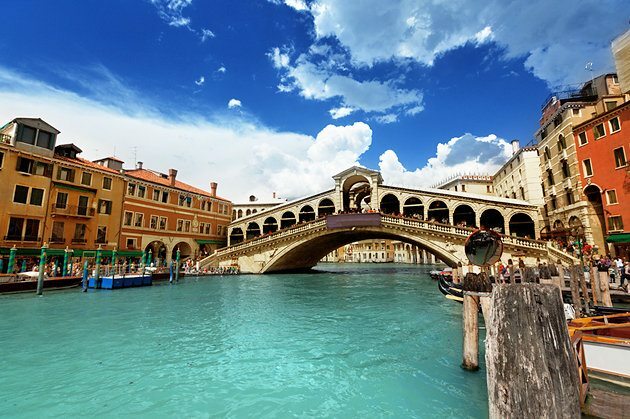 Since the 12th century, Venetians used wooden bridges at that same spot as the only way of crossing the Grand Canal. The first of these bridges was the Ponte della Moneta, which was named probably because there was a mint close by. This was actually just a pontoon—a floating bridge that was supported by boats. Normally these bridges are only for temporary use, but this one lasted until 1264, when it was replaced by a sturdier wooden bridge. It needed to be replaced because of the increasing foot traffic coming from the nearby Rialto market, and so this explains the name change. It was replaced again in 1310, and unfortunately it collapsed as well, during the wedding of marquis Ferrara. It simply couldn’t hold the weight of spectators watching a boat parade down below. And so, they decided to make the first stone bridge, and the Rialto Bridge as we know it today was born. The construction of the bridge began in 1588 and took 3 years—a pretty long time for the merchants, who complained when they had to use boats to transport their goods instead of the bridge. But in 1591 the architectural marvel was born, and everyone understood that it was worth it. The Rialto Bridge remained to be the only way people could cross the Grand Canal for almost 300 years, until the Accademia Bridge was constructed in 1854. You’ll know it when you see it—the huge 24 foot arch will be the first thing you’ll notice about this bridge. Since the bridge had to fit galley ships, an arch such as this was needed. In fact, Antonio da Ponte (the maker of the bridge) was able to beat well known artists like Michelangelo and Palladio because of this. Others wanted a classical approach for the bridge, with a lot of small arches—but obviously this was not practical for its intended use. So the contract went to da Ponte, whose name actually means “maker of the bridge”! This entry was posted in Attractions in Venice and tagged attractions in venice, famous bridge in venice. Bookmark the permalink.